The recently started maintenance at the high-ranking CoinBene exchange has brought up rumours about a possible hacker attack. 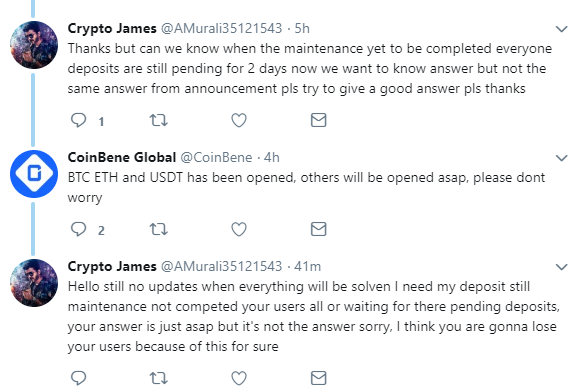 CoinBene reps are rejecting this, insisting that the maintenance is a regular one. Recently, a Singapore-based DragonEx exchange has suffered a hacker attack. As it happened, another big Singapore-located exchange CoinBene began to perform maintenance. However, rumours quickly spread that this company had also suffered from hackers but prefers not to make it public. Recently, CoinBene announced an upgrade to begin on March 26. So when over the weekend DragonEx faced the attack, some users of CoinBene began to suspect that this platform had also been hit by IT gangsters. The losses of DragonEX in digital assets have not been counted yet. 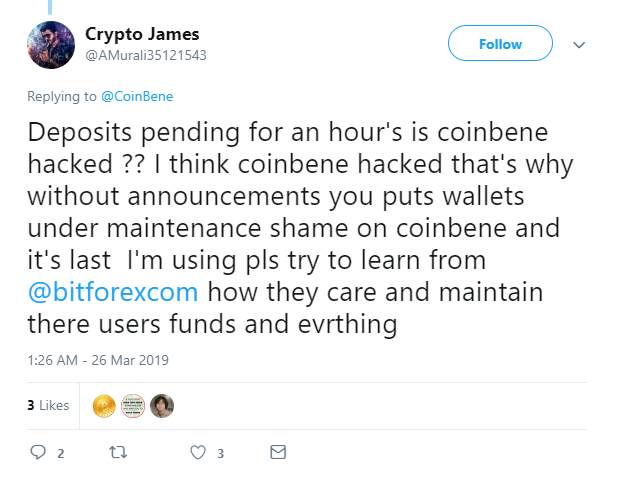 Deposits in CoinBene began to get stuck, so users started tweeting complaints. 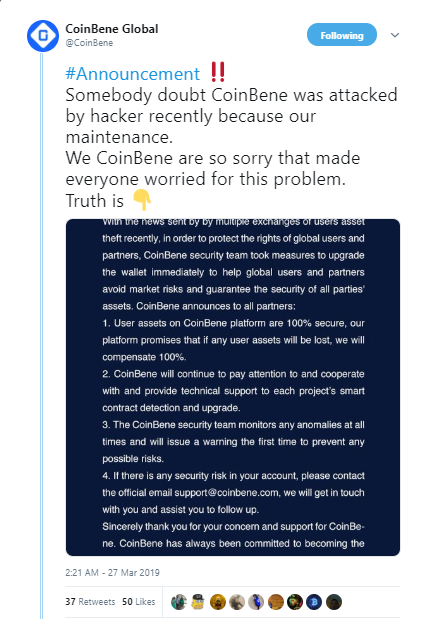 On March 27, the CoinBene exchange, probably getting tired of the rumours, decided to clarify the situation and calm the users down. A tweet posted today explains the situation, suggesting investors keep calm, stay patient and retweet the message. Some of the users, who questioned the platform, remained unsatisfied and frustrated since their deposits are still pending. Coinmarketcap ranks CoinBene as exchange #4 by daily trading volume. When any major exchange gets hacked, it raises concerns not only of its investors but makes the whole crypto community worried as well. Explaining the situation, CoinBene reported that upon receiving alerts from other exchanges about hackers’ threat, the team decided to make an urgent upgrade on its wallet. CoinBene assures everyone that customer funds are safe and should any be lost, the exchange will make a 100% compensation. As for the frozen deposits, the CoinBene team replied that for some coins (ETH, BTC and USDT) they have already been relaunched. Deposits for other assets will be fixed as soon as possible. As 2019 began, troubles started happening to crypto exchanges. 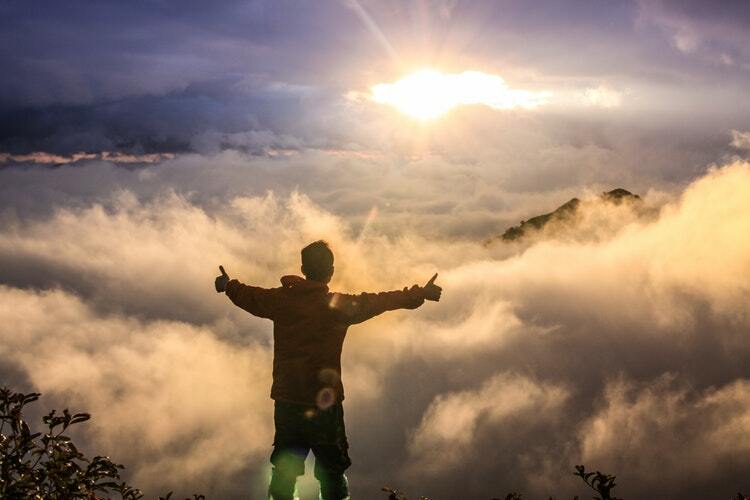 First, the CEO of the Canada-based QuadrigaCX platform died on his travel in India, being the only holder of private keys to the wallets with the customers’ money. Then, in mid-January, the Cryptopia exchange based in New-Zealand went offline after a major hack. Later on, the platform suffered a couple more attacks on the same wallets that customers kept depositing. Now, its DragonEx that has suffered from hackers. This explains why CoinBene decided to upgrade its cold wallet and implement extra security measures.